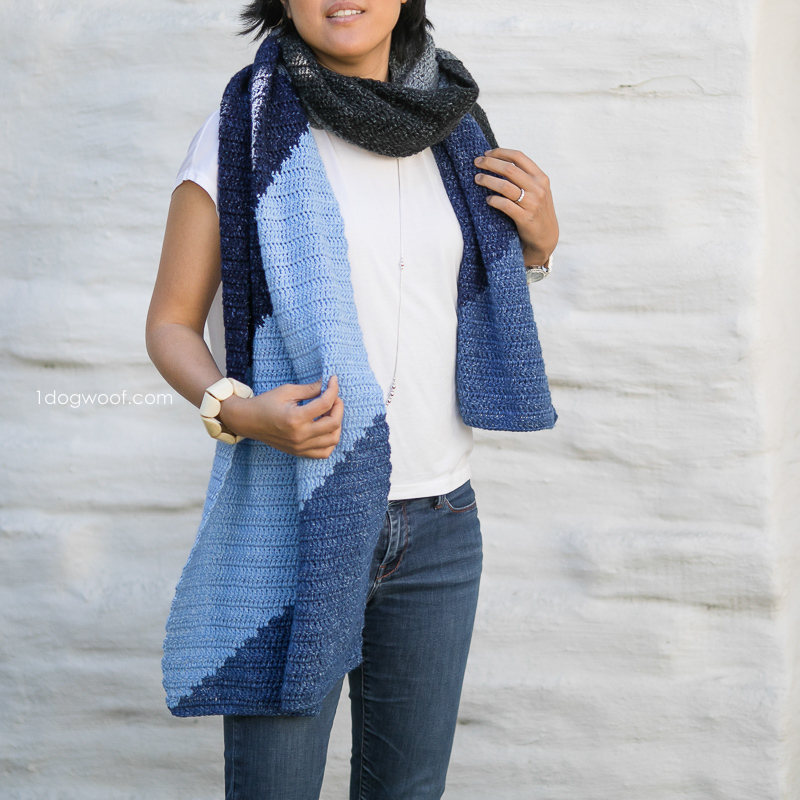 The Tangram Wrap is a simple crochet scarf wrap that is perfect for the beginner crocheter looking for a easy win. Using only 1 major stitch, it’s also a great project to take on the road, or keep around to work on whenever you have a little time. Switch the colors any way you’d like and you’ve got yourself a custom geometric design! Lion Brand had sent me samples of their Jeans Yarn, one in each color. Since I am trying to cut down and use up my stash a bit, I thought I’d try to design a project using the yarn at hand. I rather like the mental challenge of limiting myself to use what I have and making something beautiful without asking for more. The Jeans yarn was so soft and squishy, I knew I had to make something to wear. This is not a basket yarn or a tough feeling yarn to make sturdy things with. This is really something you want to feel around your neck, all the time, because it’s not itchy or furry or scratchy. It’s soft and clean and light, and makes you want to wrap yourself in it! Instead of making a striped scarf, I decided to play with triangles and calculated the right size to use up every bit of each skein. That’s why, unlike some other scarves, the gauge on this is important, since it’s meant to use up 1 entire skein. 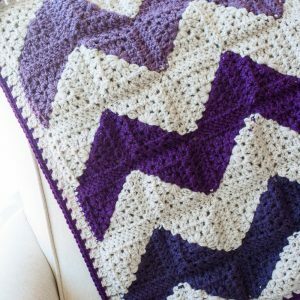 If you crochet too loose, you’ll run out before you finish the triangle! If you’re nervous, you can crochet just a tad tighter (which I think I ended up doing towards the end) to ensure you have enough yarn to get your through each shape. This scarf uses a basic double crochet stitch all the way through, so it’s super easy. It does have a single color change in each row, though. You either carry your new color an extra stitch before switching over, or switch to your new color a few stitches early. It’s great practice for color work before moving to more complicated patterns! 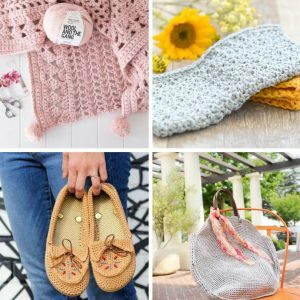 You can find the full pattern for free below. If you’d like to print the pattern, or keep a copy in your project bag for on-the-go work, you can purchase an inexpensive printable PDF from my Etsy or Ravelry shops. It has the same information formatted into easy-to-read pages. 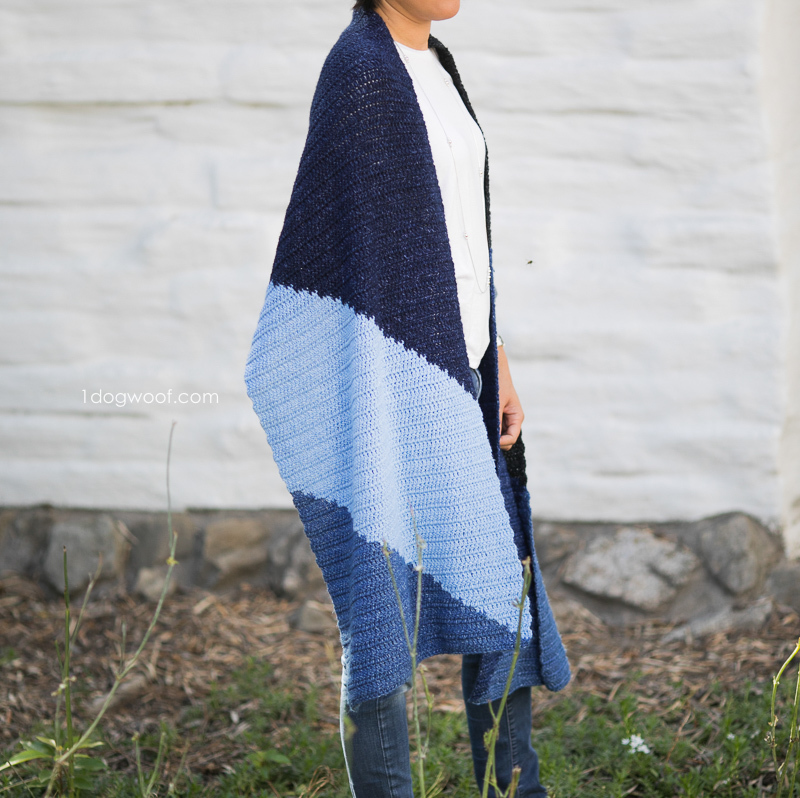 You can also buy the full Tangram Wrap crochet kit, with the exact Jeans Yarn included, from Lion Brand Yarn. It’s 20% off right now for a limited time! 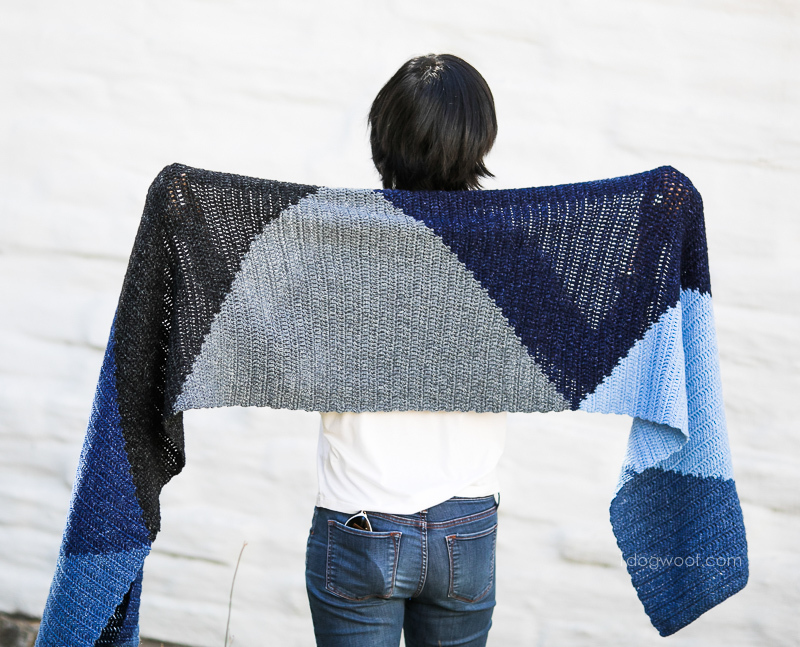 And if you’re not quite ready to start on this project yet, why not add this project to your Ravelry queue! Gauge is 16 sts and 7.5 rows in 4 inches. This gauge will use the entire skein. Looser tension may need an extra skein, especially for the Vintage section. Overall size is approximately 90 inches long and 17.5 inches wide. Row 1: (STONEWASH) Work 70 foundation dc sts. Row 2: (FADED) Ch 3. Work 2 dc. (STONEWASH) Work 68 dc. Row 3: (STONEWASH) Ch 3. Work 65 dc. (FADED) Work 5 dc. Row 4: (FADED) Ch 3. Work 7 dc. (STONEWASH) Work 63 dc. Row 5: (STONEWASH) Ch3. 60 dc. (FADED) Work 10 dc. Rows 6-27: Continue working in a slant. For Rows worked in the direction of the slant (even numbered rows), work 2 extra sts in FADED then complete the Row in STONEWASH. For Rows worked in the opposite direction of the slant (odd numbered rows, work 3 less sts in STONEWASH, then complete the Row in FADED. Row 28: (FADED) Ch 3. Work 67 dc. (STONEWASH) Work 3 dc. Row 29: (FADED) Ch 3. Work 1 dc in each st across. Row 30: (BRAND NEW) Ch 3. Work 2 dc. (FADED) Work 68 dc. Row 31: (FADED) Ch 3. Work 65 dc. (BRAND NEW) Work 5 dc. Row 32: (BRAND NEW) Ch 3. Work 7 dc. (FADED) Work 63 dc. Row 33: (FADED) Ch3. 60 dc. (BRAND NEW) Work 10 dc. Rows 34-55: Continue working in a slant. For Rows worked in the direction of the slant (even numbered rows), work 2 extra sts in BRAND NEW then complete the Row in FADED. For Rows worked in the opposite direction of the slant (odd numbered rows), work 3 less sts in FADED, then complete the Row in BRAND NEW. Row 56: (BRAND NEW) Ch 3. Work 67 dc. (FADED) Work 3 dc. Row 57: (BRAND NEW) Ch 3. Work 1 dc in each st across. Row 58: (BRAND NEW) Ch 3. Work 67 dc. (VINTAGE) Work 3 dc. Row 59: (VINTAGE) Ch 3. Work 5 dc. (BRAND NEW) Work 65 dc. Row 60: (BRAND NEW) Ch 3. Work 62 dc. (VINTAGE) Work 8 dc. Row 61: (VINTAGE) Ch 3. Work 10 dc. (BRAND NEW) Work 60 dc. Row 62-83: Continue working in a slant. For Rows worked in the direction of the slant (odd numbered rows), work 2 extra sts in VINTAGE then complete the Row in BRAND NEW. For Rows worked in the opposite direction of the slant (even numbered rows), work 3 less sts in BRAND NEW, then complete the Row in VINTAGE. Row 84: (BRAND NEW) Ch 3. Work 2 dc. (VINTAGE) Work 68 dc. Row 85: (VINTAGE) Work 1 dc in each st across. Row 86: (STOVEPIPE) Ch 3. Work 2 dc. (VINTAGE) Work 68 dc. Row 87: (VINTAGE) Ch 3. Work 65 dc. (STOVEPIPE) Work 5 dc. Row 88: (STOVEPIPE) Ch 3. Work 7 dc. (VINTAGE) Work 63 dc. Row 89: (VINTAGE) Ch3. 60 dc. (STOVEPIPE) Work 10 dc. Rows 90-111: Continue working in a slant. For Rows worked in the direction of the slant (even numbered rows), work 2 extra sts in STOVEPIPE then complete the Row in VINTAGE. For Rows worked in the opposite direction of the slant (odd numbered rows, work 3 less sts in VINTAGE, then complete the Row in STOVEPIPE. Row 112: (STOVEPIPE) Ch 3. Work 67 dc. (VINTAGE) Work 3 dc. Row 113: (STOVEPIPE) Ch 3. Work 1 dc in each st across. Row 114: (CLASSIC) Ch 3. Work 2 dc. (STOVEPIPE) Work 68 dc. Row 115: (STOVEPIPE) Ch 3. Work 65 dc. (CLASSIC) Work 5 dc. Row 116: (CLASSIC) Ch 3. Work 7 dc. (STOVEPIPE) Work 63 dc. Row 117: (STOVEPIPE) Ch3. 60 dc. (CLASSIC) Work 10 dc. Rows 118-139: Continue working in a slant. For Rows worked in the direction of the slant (even numbered rows), work 2 extra sts in CLASSI then complete the Row in STOVEPIPE. For Rows worked in the opposite direction of the slant (odd numbered rows, work 3 less sts in STOVEPIPE, then complete the Row in CLASSIC. Row 140: (CLASSIC) Ch 3. Work 67 dc. (STOVEPIPE) Work 3 dc. Row 141: (CLASSIC) Ch 3. Work 1 dc in each st across. Row 142: (CLASSIC) Ch 3. Work 67 dc. (STONEWASH) Work 3 dc. Row 143: (STONEWASH) Ch 3. Work 5 dc. (CLASSIC) Work 65 dc. Row 144: (CLASSIC) Ch 3. Work 62 dc. (STONEWASH) Work 8 dc. Row 145: (STONEWASH) Ch 3. Work 10 dc. (CLASSIC) Work 60 dc. Row 146-167: Continue working in a slant. For Rows worked in the direction of the slant (odd numbered rows), work 2 extra sts in STONEWASH then complete the Row in CLASSIC. For Rows worked in the opposite direction of the slant (even numbered rows), work 3 less sts in CLASSIC, then complete the Row in STONEWASH. Row 168: (CLASSIC) Ch 3. Work 2 dc. (STONEWASH) Work 68 dc. Row 169: (STONEWASH) Work 1 dc in each st across. I now keep this scarf wrap at work for when it get cold in the air-conditioned space. It’s great to just throw around your neck, and the denim matches every outfit! I’ve received so many compliments on it when I attend meetings, even though people see it every day! I’d love to see your versions if you decide to make your own. You can change up the different color blocks or even use other colored yarn! Each Tangram Wrap can be as individual as the tangram puzzles themselves! 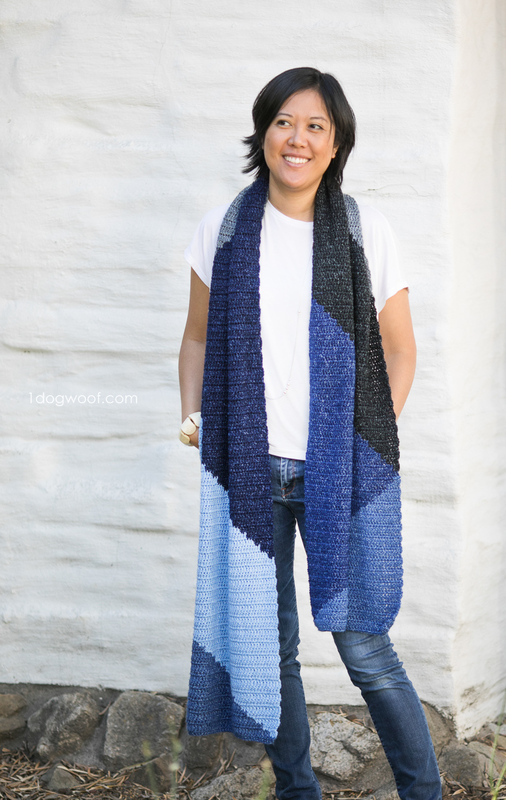 Love your Tangram Wrap pattern! Have printed the instructions and notice Row 56 is listed twice (instructions list Rows 34-56 and then Row 56 again). Also, Row 146-165 and then instructions go to Row 168. Is the numbering off? Hi Carol, eagle eyes! They were typos, but the pattern itself is still correct. I’ve fixed it here and will be pushing out new PDFs. Thank you for letting me know! This is beautiful. I love the way you can position it so the “brand new’ makes a triangle draping down from your shoulders. Thanks for posting! Can you recommend a youtube or more details on how to change colors? As a beginner I need more instructions. Merci pour ce partage de projet. Is it possible to make this wrap with only 3 colors? I am living in Swaziland and yarn (or as they say here, wool) is hard to find. I have 6 skeins of yarn but in only 3 colors. Thanks! 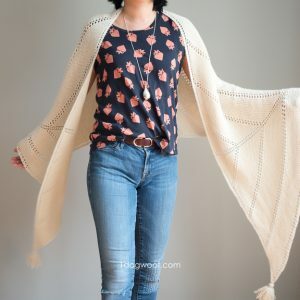 I am going to make this with Caron cakes because I love it and I bought the yarn. Will it work out ok? I won’t be changing colours obviously. Hello! I’m very new to crochet, and one of the hardest parts for me hasn’t been the stitches themselves, but trying to read patterns. I see 70 dc stitches as the foundation row – but does that mean chain 70 and then turn the work, and make 70 dcs? I’m also unsure how to change colors within a work, and I’m off to youtube to learn how to do that. The wrap is lovely! I purchased the kit through the Lion Brand site and I’m just now getting started on it. An update! I watched a tutorial on youtube about the FDC foundation-double-crochet. YAY! Sorry for my own confusion! I’m off to a good start, although I have found that the “I” hook and this foundation made mine far, far too big, so I’ve switched to an “H” hook. Quick question….Do you carry the yarn for your color switch back and forth or are you cutting and weaving your ends in on each row? I don’t believe she answers any questions.